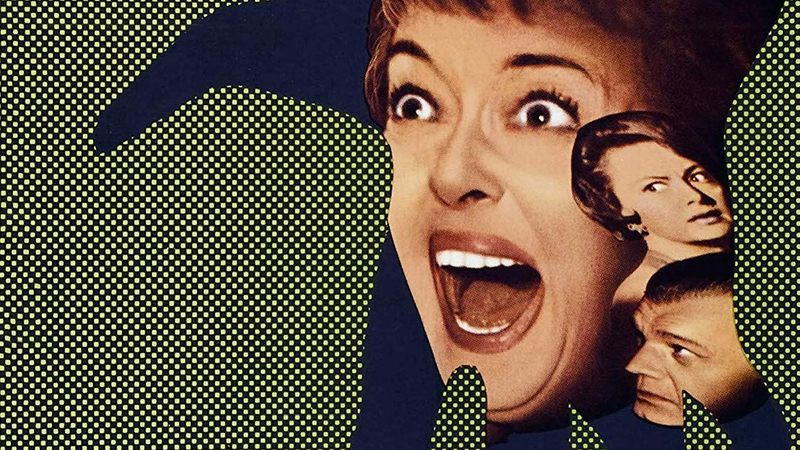 Two years after the release of his classic, Whatever Happened to Baby Jane, director Robert Aldritch revisits psychosis with Hush…Hush, Sweet Charlotte, a chilling tale about the madness of grief and guilt told in the Southern Gothic mode. In 1927 Louisiana, the married John Mayhew (Bruce Dern) is planning to leave his wife and pursue an affair with Sam Hollis’s daughter (Victor Buono). John arrives at her antebellum mansion to tell Sam of his plan, but Sam blackmails John into breaking it off with his daughter. At her party later that night, she does not take the news well, and while regrouping away from the party, John is brutally murdered in a scene that remains breathtaking in its power to shock. A blood-drenched Charlotte emerges from the scene moments later, before we cut to nearly forty years later, with Sam dead and Charlotte, now played by a magnificent Bette Davis, living alone in the mansion and apparently driven mad by her crime. Baby Jane’s legacy echoes throughout Sweet Charlotte, from Davis’ makeup and performance, to the fact that Joan Crawford was originally cast alongside Davis, and even that the short story upon which the film was based was called Whatever Happened to Cousin Charlotte. Yet despite their similarities, Sweet Charlotte is a very different beast to Baby Jane, lacking to a great degree its spiritual predecessor’s vindictiveness. Indeed, Charlotte herself is a deeply sympathetic, if erratic figure, as much a victim as her hapless late lover. Tormented by his death, she’s been driven to the brink of sanity, her only company being her equally eccentric housekeeper, Velma (Agnes Moorhead). Their relationship, and Velma’s ferocious loyalty to her mistress is contrasted against the high-falutin’ ways of cousin Miriam (Olivia de Havilland) and her erstwhile fiancée, Drew Bayliss (Joseph Cotten), who arrive to help Charlotte with an eviction notice. While Miriam, Drew and Velma vie for guardianship over Charlotte, the spectre of her crime hangs low, weighing down the house and its occupants. As Charlotte’s emotional intensity heightens, so too do her delusions, trapped in a ghost story of her repressed guilt and bottomless grief. As Charlotte’s emotions become ever more extreme, so too do the film’s aesthetics. Expressionist shadows loom and stab through the darkness, as Joseph Biroc’s cinematography warps the mansion into mad dimensions. An aerial shot of the house’s circular staircase is repeated several times, suggesting Charlotte’s spiraling psychological collapse. The stand out sequence, however, is a surreal scene in which Charlotte imagines herself back at the party. All the attendees are wearing eerily expressionless masks which are almost fetishistic in their pathological blankness, while the dismembered and decapitated body of John approaches her, as if to invite her to a macabre dance. As an analysis of grief as a shifting, subjective ghost of the past, Hush…Hush, Sweet Charlotte is second to none.